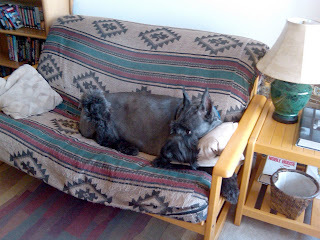 Boogie went to the groomers yesterday for his bath and his haircut, so he's a tired and sore pooch today. Poor old guy just doesn't recover the way he used to. Sort of like everyone else I know. Luckily he has his oh-so-comfy futon on which to recover.